rule of two of three,” in which the outcome would be determined by whichever side two of the three branches of government were on. That’s fascinating, isn’t it? Unless I’m misremembering my lessons from Schoolhouse Rock, just about every law ever passed was approved by two out of three branches of the government. So this means the Supreme Court would never be allowed to overturn a law. 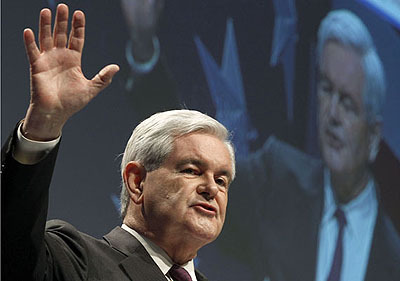 Surely even Gingrich doesn’t believe such a thing? Even for Newt this is crazy stuff. I’ve heard of strict scrutiny and original intent and reasonable doubt, but I’ve never heard of the “strikingly at variance with America” rule. But not to worry. If you read more about Newt’s views on this, it turns out that “strikingly at variance with America” isn’t nearly as vague as you think it is. What it really means is any court decision dealing with religion in the public square. Newt wants religion front and center in the public square and he wants it funded and fully endorsed by any level of government that’s so minded. And woe betide the judge who tries to get in the way. That’s pretty much it. Oh, he also makes some noises about decisions that restrict the president’s power to handle enemy combatants any way he wants, but it’s really nativity scenes and prayer in public school that animate him on this subject. He doesn’t just want America to be a Christian nation, he wants to make sure the government is allowed to marshal all of its considerable resources to ensure it is a Christian nation without any pesky courts getting in the way. He’s a visionary, Newt is.